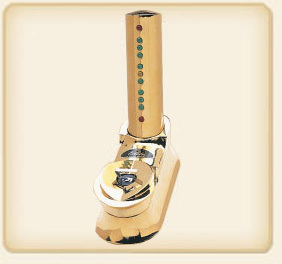 Heat Tester: Electronic curling Iron temperature unit. Golden Supreme has Taken the "Guess Work" out of thermal iron heat. This unit measures the temprature of the thermal iron. Takes the guess work out of thermal Iorn styling. Gives reliable temprature range whether working on fine hair, processed hair or coarse hair. 10 lights to indicateheat range, low, med. high. Permits the stylist to determine the exact temperature needed in styling any type of hair from fine hair to hair that's been damaged from over treatment by chemicals to long and heavy coarse hair. All Heat Testers are Available in 120V or 220/240V. For international customers, please specify your country and plug type in your order notes.